Finally - Accurate & Affordable Free SO2 Testing! In winemaking, Sulfur Dioxide (SO2) is one of the most important and effective tools in the winemaker's arsenal for protecting against the effects of oxidative or microbial spoilage. Unfortunately, over time any SO2 added to a wine will be consumed due to its interaction with the very things that it is protecting the wine from. The ability to accurately monitor the amount of SO2 remaining available in a wine to protect it - termed Free SO2 - is hugely important when it comes to ensuring that the wine makes it through the aging process safely. For years MoreWine! has offered a variety of methods for testing the level of Free SO2 in a wine. Until now, winemakers had to make a choice between inexpensive test kits which lacked accuracy and kits which are highly accurate but cost hundreds of dollars. Now MoreWine! has developed an inexpensive AND accurate test kit which we feel has a place in every home winery. PLEASE NOTE: This kit ships with a small bottle of 25% phosphoric acid which is required for the test. At this strength phosphoric acid is considered a hazardous material and we are not certified to ship larger quantities. We recommend that you investigate the possibility of sourcing it locally, through a laboratory supply company. If this is not possible, you can purchase it through us; see part #s MT108DS & MT108BDS. The high cost of these bottles reflects the $20 surcharge which FedEx adds to handle a hazardous shipment. These bottles ship directly from our supplier's warehouse and will take a couple of extra days to arrive. Click here to download a copy of our instruction manual for this kit. Recommended by a friend, purported accuracy reviews were very positive. This is affordable and provides accurate results. I enjoyed putting the system together and running the tests. We have a merlot and a Pinot noir in two fermenters. 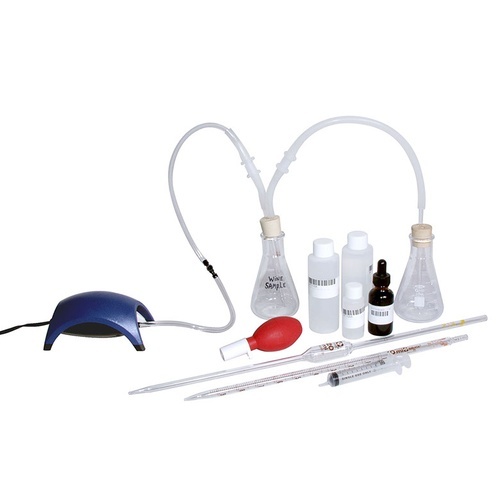 I have used this kit a few times now and I can really see a difference in my wine I make now versus the wines I made without doing any SO2 testing. I will start out with the fact that I have a Ph.D. in biochemistry and have published over 100 peer reviewed scientific papers. I run a research lab that has been funded for over 25 years. Clearly, I know how to do simple titrations such as required for this kit. I used the entire bottle of HCl and could not get the indicator reagent to change color. I cannot recommend wasting money on this kit if they do not have the quality control to ship reagents that are the required concentrations. After years trying to use Titrets with red wine, this is night and day better. I would say its accurate to about 5ppm. While the procedure is fairly complex, the videos and docs are very good. Pick up a second 10ml pipette if you get this kit- honestly it should have come with 2- so you don't cross contaminate your reagents. Works well, takes time, but very accurate. Very appropropiate for certain wine-makers. It helps to test several wines at the same time. I've had this A/O tester for about two years, but recently refined my technique. Now I use a buret for TA titrations, and it is an advantage with the A/O test too, but not a necessity. I recently tested this equipment for accuracy. As a standard, I mixed a fresh solution of 50ppm k-meta and distilled water. Then I ran the A/O test on it. The result was 49ppm, probably better than my margin of error for mixing the k-meta. Bottom line, this kit is very accurate when used properly. It takes a little time to develop the proper technique, so be prepared for that. In addition to the basic kit, I have a buret and stand, and I standardize my NaOH titrate. You can get along quite nicely w/o this though and still get close results. Very accurate test for S02 levels. A little tough assembling the glass tubing through the Rubber stops, but if you add a little Vaseline, and dilate the holes larger, by using a metal object close to the same diameter as the glass tubing, the glass tubing goes in fairly easily. The chemistry is fun to do, and follow the steps of video.